I tried to teach a friend how to knit once. It went very very badly. We were both frustrated and I don't think she'll ever pick up needles again. So I was a bit hesitant to agree to teach a co-worker to knit. She said she knew how to crochet and always wanted to learn how to knit. I figured that at least she knew how to make a slip knot and about keeping even tension. We finally sat down today at lunch for our first lesson. I cast on for her and told her not to worry about that part, that I'd teach her later. I showed her how to do a knit stitch and even recited the rhyme. She went stitch by stitch reciting the rhyme for the first row. Then she knit the second row, and a third and a forth. She kept dropping the left needle, leaving a couple stitches hanging there to be picked up again, but she did it and she learned how to hold on to that needle while wrapping her yarn. Then we went onto purling. She purled 4 rows and the rhythm of her needles moving was so much more confident than it had been when she knit. She went into stockinette stitch almost effortlessly. Her tension was fairly even and she wasn't fighting every stitch because she was knitting too tightly. I told her she was knitting a gauge swatch so we could figure out how big a hat she needs. I explained why a hat (thanks to the Yarn Harlot) and not a scarf and she agreed that she'd rather do something that had a lot less knitting than a 5 foot scarf and something she is more likely to finish and use before the winter is over. She is jumping in with both feet. I sent her home with links to KnittingHelp.com in case she needed a visual reminder. She wants to knit again tomorrow at lunch. I could get used to this converting the Muggle masses to our knitterly ways. Slipper socks for my Nephew. 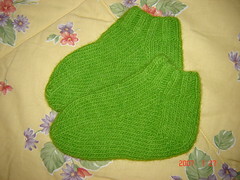 These are the completed Baby Cable Rib socks from Sensational Knitted Socks. I used Briar Rose Sea Pearl and they are the most lucious socks I've ever had on my feet. The yarn was so soft and shiny and I'd use it for another pair of socks in a heart beat! I found this over at Domestic Overlord's Blog and I thought I'd play along. Consider yourself tagged if you feel like playing. Just a quick post to show off Argosy using the Violet's Pink Ribbon yarn from Lisa Sousa. It is coming out so great! I love the yarn. Very soft and you can't beat the quality and quantity for the price! And... Adorable little Katie all snuggled up. What a sweet pea! (Yes, she has her head on a pillow). Lisa Sousa sock yarn! On the right is Violet's Pink Ribbon and on the left, Berry Poppins. I've started Argosy with the Violet's Pink Ribbon, but there isn't enough knit yet to show a proper picture. Maybe before the weekend is over there will be enough for a decent photo op. For the most part, I really like my job and the people I work with. The one thing that makes me crazy is the copy machine. Not the machine itself, which is a high end copy/printer/scanner and its great when it works, because it jams constantly. We’re a small office and only have the one copier. I call service at least once a week for this machine we just got back in October. It’s frustrating. But what really has me steaming this morning is the blatant disregard for the very large note I placed on the machine yesterday that says “Service has been called”. I work with highly educated people; Geologists, engineers, architects and ecological scientists. This morning one of them is over at the copier trying to use it. Naturally, it is jamming and he’s opening the side door to clear the jam and slamming it shut and trying again and hitting the machine and going through the process over and over and over again. I got up and walked over to him and told him that I had called for repair service and they are coming this morning. I pointed to the sign that he REMOVED FROM THE COPIER. He nodded at me like he didn’t understand bowed a little bit and continued to try to get the machine to copy. Another one of the brain squad came over and tried to help him. I told them both that service was coming this morning and that they would have to wait to make a copy. They are still standing at the machine trying to get it to work. Slam. Bam. Slam. Machine runs. “Beep Beeeeeeep”. Slam. Bam. Slam. Socktopia 2007 has begun and I’m knitting socks like a fool. I’m using the yarn I got at Rhinebeck from Briar Rose. It’s a 50/50 Mernio/Tencel and I love the way it feels and the sheen on the yarn. I may never take these socks off once they’re done. We had three themes to pick from and when I saw that “Blue Monday” was one of them I had to use this yarn. 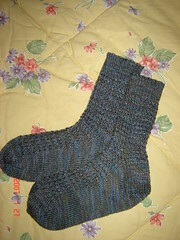 I’m using the Baby Cable Rib pattern from Sensational Knitted Socks. I love it so. Lady Eleanor continues to grow. I have 5 more skeins of wool and then I’ll decide if I need to go longer or not. I like my shawls to be fingertip to fingertip and I’m tall so I’ll see where it ends up. I have a couple of items I’d like to admit are in the UFO heap and will commit to knitting on each of them every week till they are done. Cinxia and Viveka will be first because they’re definitely for colder weather. Although, the colder weather thing… We’ve had unnaturally warm weather here in NJ. It may possible get up to 70 degrees tomorrow. Maybe I shouldn’t worry about knitting those warmer sweaters first. I finished the Socks that Rock and although it looks like I have a BIG HUGE gusset hole issue, it’s actually a goof in the pattern I made up. I didn’t plan for that very well and I didn’t notice it when I was knitting the 1st or 2nd sock, so it will stay there as a lesson to check self created patterns more carefully.